It’s no surprise that animals adore their owners, dogs especially, but this love reached new heights this week at Johns Creek Harbor, Australia. According to lifewithdogs.tv, Sky — a once malnourished stray — was rescued by Franz Van Derpoll and the two quickly became best friends. Courtney Fowler of Pilbara News reports that Derpoll was spear fishing for dinner when the heroic act occurred. As Derpoll dove into the water, he didn’t notice two sharks had begun to circle the area. 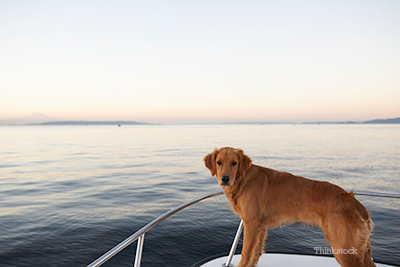 By the time he realized his life was in serious danger, he returned to the boat only to see his loyal dog had already recognized the crisis and jumped in protect him (lifewithdogs.tv). Sky had sacrificed her own life for her beloved companion. If it hadn’t been for her courageous actions, Derpoll may have been the target. Sky was not an ordinary dog. Derpoll told Fowler, “Everyone at the harbor knows Sky, every single person. She never left the harbor… that was her home.” There is a special plaque that now hangs at Johns Creek Harbor in memory of Sky, says lifewithdogs.tv. This courageous dog will not soon be forgotten.